Mature red drum (S. ocellatus) showing characteristic spot(s) at the base of the tail: This one is not a "bull red" because it is shorter than 27 inches (0.69 m). The most distinguishing mark on the red drum is one large black spot on the upper part of the tail base. Having multiple spots is not uncommon for this fish, but having no spots is extremely rare. As the fish with multiple spots grow older, they seem to lose their excess spots. Scientists believe that the black spot near their tail helps fool predators into attacking the red drum's tail instead of its head, allowing the red drum to escape. The red drum uses its senses of sight and touch, and its downturned mouth, to locate forage on the bottom through vacuuming or biting. On the top and middle of the water column, it uses changes in the light that might look like food. In the summer and fall, adult red drum feed on crabs, shrimp, and mullet; in the spring and winter, adults primarily feed on menhaden, mullet, pinfish, sea robin, lizardfish, spot, Atlantic croaker, and mudminnows. Red drum naturally occur along the eastern and southern Atlantic and Gulf of Mexico coasts of Louisiana, Texas, Alabama, Mississippi, Florida, Georgia, the Carolinas, and Virginia. Aquaculture activities involving them occur around the world. Immature red drum prefer grass marsh areas of bays and estuaries when available. Both younger mature red drum (3-6 years of age) and bull red drum prefer rocky outcroppings including jetties and manmade structures, such as oil rigs and bridge posts. Around this type of structure, they are found throughout the water column. Mature red drum spawn in near shorelines from mid-August to mid-October. The red drum's eggs incubate for 24 hours. A female lays about 1.5 million (with a range of 200,000 up to more than three million) eggs per batch. Scharf (2000) reported that in the first year, young red drum in Texas estuaries grew about 0.6 mm per day, though the rates varied with location and year and were higher in more southerly estuaries. After the first year, they may be 271 – 383 mm long. About half of red drum are able to reproduce by age 4 years, when they are 660-700 mm long and 3.4 – 4 kg in weight. Red drum can live to be 60 years old. Adults mature by 3 – 5 years of age; approximate length at maturity: males – 28 inches, females – 33 inches. Spawn during late summer and fall occurs near estuary inlets and passes along barrier island beaches. Males produce drumming sounds using muscular contractions to vibrate the swimbladder, to attract females. where weight is in grams and length is total length measured in millimeters. For example, these relationships predict that a 600-mm red drum (just under 2 ft long) would weigh about 2300 g (just over 5 lb). 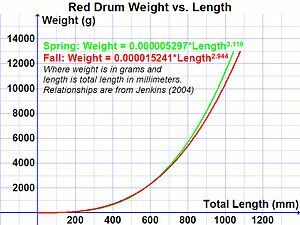 These relationships can be used more specifically to determine how healthy a sample of red drum is by comparing their actual weights to weights predicted by these relationships for the same length. In the early 1980s, the chef Paul Prudhomme made his dish of Cajun-style blackened redfish (red drum) popular. His seasoning was then sold commercially and the dish became so popular that redfish were overfished to the point of near extinction. On March 1, 2009, redfish was the "secret ingredient" on the television program Iron Chef America, with competitors Mourad Lahlou and Cat Cora both preparing several dishes from the fish. From 1980 through 1988, commercial fishermen took an average of 28% of the redfish, while sport fishermen harvested 72%. Catch limits and size restrictions have increased the average weight of redfish caught in Louisiana coastal waters. Restrictions on both sport and commercial fishermen allowed the species to rebuild. States actively vary the recreational catch limits and minimum and maximum lengths to help maintain sustainable red drum populations. Executive Order 13449 of October 20, 2007, issued by U.S. President George W. Bush, designated the red drum as a protected game fish. The order prohibits sale of red drum caught in federal waters and encourages states to consider designating red drum as a protected game fish within state waters. While they may no longer be commercially harvested in U.S. federal waters or in most state waters, they are readily caught and still enjoyed as table fare by many. In addition, farm-raised redfish are still available as a commercial product  Commercial netting disappeared after coastal states such as Florida declared red drum prohibited for sale. Recreational size and bag limits have been highly effective, allowing daily limits to be increased in recent years. ^ Peters Life History of Red Drum Peters, K.M., McMichael Jr., R. H. Florida Department of Natural Resources Bureau of Marine Research, St. Petersburg, Florida. ^ Wenner C. 1999. Red Drum: natural history and fishing techniques in South Carolina. Marine Resources Research Institute, Marine Resources Division, SC Department of Natural Resources, Charleston, SC. 40 pp. ^ "Executive Order 13449: Protection of Striped Bass and Red Drum Fish Populations". Office of the Federal Register. October 20, 2007. Retrieved October 24, 2007. ^ Fritchey, Robert (1994). Wetland Riders. Golden Meadow, Louisiana: New Moon Press. "Sciaenops ocellatus". Integrated Taxonomic Information System. Retrieved 24 January 2006. Texas Parks and Wildlife Department. Red drum (Sciaenops ocellatus). Retrieved on 6 August 2009. Froese, Rainer and Pauly, Daniel, eds. (2005). "Sciaenops ocellatus" in FishBase. November 2005 version.